AdTech and MarTech development projects don’t need to take years before they reach initial users. 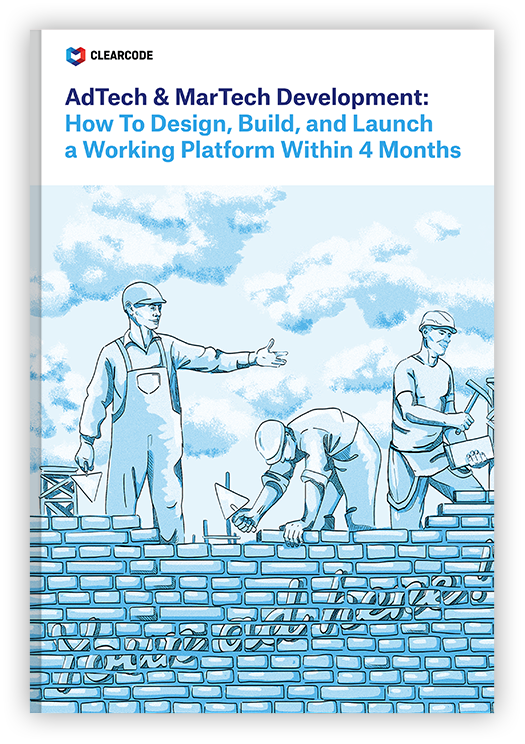 By adopting an agile and incremental approach, brands, agencies, and vendors can design, build, and release the first working versions to users within just four months! Designing and building custom AdTech/MarTech platforms from scratch: Learn how to build new software from the ground up, select the right tech stack for the project, and uncover the benefits of this approach. Building new AdTech and MarTech platforms on top of existing platforms: Discover how to speed up development time by utilizing open platforms (e.g. Beeswax, BidSwitch, and AppNexus) and building new solutions with APIs. Expanding existing platforms with custom integrations: Find out how to access more data and inventory via protocols and libraries, such as OpenRTB and Prebid.js. The development process: Discover how an agile and incremental approach to software development can produce the first working version of an AdTech or MarTech platform within just 4 months. The development team: Educate yourself about the various options you have available when it comes to selecting the development team, from in-house developers and body-leasing companies through to specialized development partners, as well as the advantages and disadvantages of each option. Case study: Kanary Nest demand-side platform (DSP): See an example of a DSP development project in action.